The Scouts Online website platform is continuing to evolve. As well as cosmetic and branding changes, we've added more functionality to help you promote your local Scouting; keep your members informed and help Districts and Counties manage Scouting activities. In particular we've added more form templates, for you to use on your website. Please have a look at a full list of recent changes below. I'm also pleased to announce that we're now offering District All Units Websites so you can promote all the Units in your District from a single website. Please see BELOW. Most of the new features have been suggested by fellow Scouts Online website users, like you. Thank you to Rod, Jonathan, Jon, Gareth, Tom, Martin, Mark, Ian and many others for your ideas. If you've got a good website idea, that could also benefit other Groups, Districts or Counties, please contact me. Thank you for continuing to partner with Scouts Online. It's great working with you. PS. If you have another leader that would like to receive future newsletters, please ask them to complete THIS FORM and tick the News / Update Information box. The following changes apply to Group, District, County and Campsite websites. 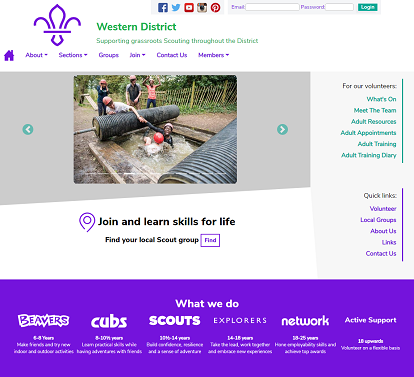 As you may have seen, The Scout Association is in the process of re-designing www.scouts.org.uk based on the colours scheme launched in 2018 and a modern look-and-feel. Although these changes are in the early days, we've created a new home page design and a new theme to reflect the layout and keep your website on-brand and up to date. You can change the look-and-feel of your whole website by changing the Website Theme and Page Design fields in Global Settings or Group Details, or contact us and we'll do it for you. Who are we? : The default introductory text shown on home pages has been refreshed. Photo Album Management: Scout Branding Tips have been added to give you some advice on the type of photos you should use. News Management: "Tone of Voice" tips have been added to help you with your on-brand messaging. When the booking form and maximum number of attendees fields are set on your events, the details collected on the online booking form will be stored within the event's settings. You can also export these details to a CSV file, to view in Excel, using the [Export Attendees List] button. This form, which is shown on the Contact Us page of District/County sites and may also be used on Group sites, has been updated to make the address field mandatory. We hope this helps you direct the details to the appropriate local group. You may have noticed that the website page URLs that appear in the address bar at the top of your web browser, have been cleaned up. You no longer see the .aspx file extensions or the Default.aspx page names on home pages. Links to your pages from external sources continue to operate correctly. Website visitors use a wide variety of devices to view websites. Scouts Online websites were originally designed in line with the legacy www.scouts.org.uk design, which was best viewed from a desktop or laptop device with a wide screen. When viewed on a mobile phone or tablet, the page content was small and challenging to read and navigate. All Scouts Online websites are now mobile friendly. Page content is automatically re-positioned and adjusted to maximise the user experience, irrespective of the width of the viewer's device. Your website visitors may now add a calendar to their Microsoft Outlook (or other calendar app) with details of your website events. The events list will update every 7 days. Users that have logged in to your website will see a [Subscribe to Calendar] button on many of the event list pages. You could also copy/paste this link into an email and send to parents and leaders manually. The default content on your website is maintained centrally by us, as part of the the on-going partnership we enjoy with you, to save you time. As The Scout Association has deleted some videos from their YouTube channel, that were used on your website, you may have noticed that we've replaced the original default videos with more recent Scout videos. This applies to videos on the About Us page, group page, sectional home pages and the sectional promise pages. We've also changed the YouTube control to stop it showing suggested videos after the video has finished playing. A new "Country" field has been added to the Global Settings and Group Details pages. This controls the colour of the Scout logo and your name on the page header bar. Over time we expect this field to be used for other features too. The File Manager now shows the amount of storage space you've used up on your website. To minimise space and maximise page load speed, photographs have always been resized when you upload them. However, as we all take thousands of photos, disk space will soon fill up if every photo from every leader's phone is uploaded. It's great to share your adventurous and fun activities with parents, prospective members and other Scouters. Photo album views may increase if photos are varied and near-duplicates are avoided, whilst still including images of all your members. It helps minimise file space if photos are selected prior to uploading. If you want to add videos, why not create a YouTube account, link it in Global Settings/Group Details and add the videos to your sectional pages? The Scout Association has updated a number of forms recent. We've updated the default links on the Adult Appointments page to point to the new versions of the forms shown above. If you use the default list of links, then your site has already been updated. If you've overridden the default links lists, you will need to update these manually from HERE. When you setup an event, you can add a booking form to allow your members to booking on your website. 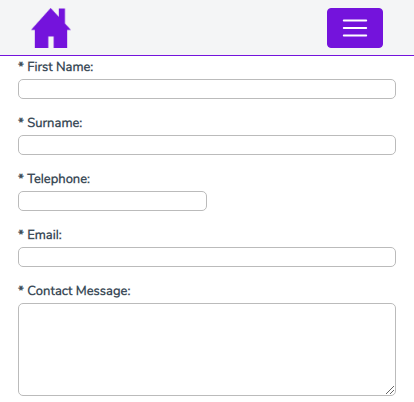 On top of the Basic Booking Form, which captures contact details and notes, we've added two more form types to capture specific information. Training Course Booking Form: As well as contact details, this form captures the adult's Scouting details, emergency contact details and special, dietary and other requirements, plus additional notes. AAC Interview Booking Form: This form type captures contact details, Scouting role and group + any special, mobility or other requirements. Module 39 has been added to Event Management and the list of adult training modules re-ordered. The training diary page has also been changed to sort by the course start date and then by the course name. So, if you want courses on a particular day to sort by module number, just add the module numbers to the start of the course title. Many Districts and Counties have regular award ceremonies to present Chief Scout's and other Awards to their youth members. A new form type has been added to capture details of young people who should be included in the event. A link to this online form has been added to the Members/Adult Resources page, but you could also add the form to a new page along with information on your ceremony. A new standard form type has been added to make it easier for your adults to nominate fellow Scouters for good service awards. A link to this online form has been added to the Members/Adult Resources page. You could also add the form to a user defined page. The role description fields on the Admin/User Management page have been increased to 50 character to help you show multi-role descriptions or describe their duties better on Meet The Team and other team lists. How about providing a website for each of your District's Groups? We build group websites from just £3 a month. There is no need for technical knowledge or even an inclination to keep it updated. Each group website would promote the group and improve their online profile. Contact us to discuss further or see Group Websites for package features. Scouts Online websites include Online Scout Manager integration for badge progress, programme events and more. To ensure the OSM integration operates as required, more OSM badges have been mapped to the website images. Images for new Scout badges have also been added to the File Manager. A News & Blogs page has been added to each section's sub-menu. As standard, this page is not shown, but you may switch it on from Admin/Page Management. We have made changes to the Scouts Online platform specifically for Explorer Scout Units, Scout Network Units and Scout Active Support Units. Group based ESU: Where a group already has a Scouts Online website, we can add the Unit's details to the group website for no additional charge. One website for a single ESU, SNU or SASU: Unit websites start at £3. One website for all District Units: We can provide a single website that showcases all of the Units in your District. For more details see www.ScoutsOnline.co.uk/Marketing/UnitSites or contact me. Over the years we've added more than 20 standard contact form layouts for you to use on your web pages, so we thought it would be useful for you to see them in one list. I hope a few of these inspire you to add new pages and provide services to your members and adult teams. Please let me know if you come up with some good ideas that others may like. The Scout Association are in the process of changing some of the paper-based forms. If you notice a new field has been added to a form or the format has completely changed, please let us know so that we can update the online forms. The more websites we supply, the more the platform will evolve to the benefit of us all. We would therefore appreciate your help by recommending Scouts Online to your neighbouring Groups, your DC, other Districts and your County. It would really help if you could add a link to www.ScoutsOnline.co.uk on your next District/County newsletter or mention Scouts Online to your Scouting friends. You could also follow the Scouts Online Facebook Page and Like/Share any posts of interest. Scouts Online build websites for Scout Groups, Districts/Areas, Counties/Regions and Campsites. Group websites now include OSM integration. Thank you for your help in anticipation. You can keep up to date with Scouts Online news by following the Scouts Online Facebook page HERE.